Last year, our client in Bluffton, Indiana purchased a brand new piece of equipment: a Crown Turret Truck. 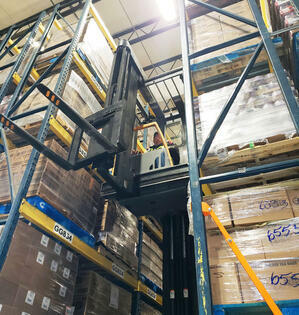 The machine is capable of reaching higher levels in warehouses. Only problem was that neither our client nor any Merit associates new how to operate this unique piece of equipment. With space in the warehouse running slim, our team knew we had to get this machine active. Our Risk and Safety Manager, Belinda Ochoa, helped get the necessary training materials from Crown that met OSHA standards. Then our ASM Brian McClain went to work studying the material and learning all about how to operate the machine. Brian spent a couple days familiarizing himself with it and today, he is a certified trainer for this equipment and has trained four associates on how to operate it as well. By taking the initiative on this equipment, Merit was able to not only provide our client with a unique service, but we drastically increased our space in the building as well. Great team effort and another example of how our Merit associates are alwayslooking at continual improvement opportunities. Big thanks to Brian McClain and Belinda Ochoa for making this happen.